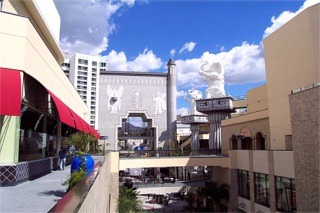 This is a view from the new Kodak theater complex. Just opened in 2002. 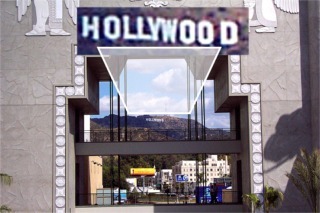 The archway frames the famous Hollywood sign off in the hills. For the first time there is a place where you can see it. The complex is very nice and has shops and places to eat. AND some of them the average Joe can actually afford. This has really dome a lot to make Hollywood a place to spend some time rather then 10 to 15 minutes. Here I enlarged and brought forward the Hollywood lettering so you can see it. 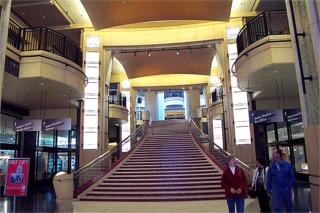 This is the stairway leading up to the Kodak Theater. If you watched the Oscars I'm sure you heard the red carpet is not really red anymore. It is the color of the carpet on these steps. 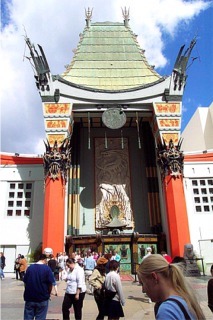 This is the famous Grauman's Chinese Theatre where the stars left their impressions. Karen's hands and feet fit perfectly in Marylin Monroe's impressions. Notice all the people looking down. Of course my hands and feet fit here. Arnold !!!! 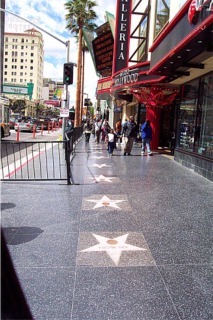 This is part of the Hollywood walk of fame. Right in front of the new Kodak Theater. You can see the guard rail they have put up. We were here one week before the Oscar's and they were setting up bleachers already. 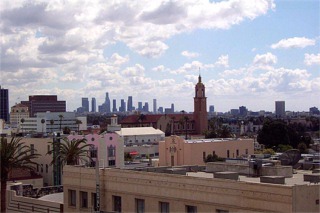 This is a view of the Los Angeles sky line from the Kodak Theater complex. I can't say enough about what this complex has done for Hollywood. Before people would come and spend a few minutes looking at the stars footprints at Mann's, then look at the stars in the sidewalk and leave. Now Hollywood actually looks nice.